What is the collective noun for crabs anyway? Dose, cast or bushel, apparently. Placed in a regular grid, all clicking in time, they looked a bit too regimented. So I nudged each crab’s coordinates left a bit, right a bit, up a bit, down a bit. Using ImageMagick I extracted the frames of the original animated GIF, then recombined them with altered sequencing. I did this a few times until I had a more pleasing picture. Here’s a sketch of how you can do this. The -loop 0 parameter means loop forever; the delay is in 100ths of a second. Sorry if you find the animated GIFs disturbing. I’d be interested to find out how much of the CSS layout works in a feed reader. As a reader, I skim through material in a feed reader; I like the vanilla styling and can always visit the real home of an article which particularly interests me. I also prefer full fat feeds to teasers. As an author, I generate a full feed, indirected via Feedburner, now hosted by Google — and who knows how it’s really being consumed? RSS and Atom feeds are great, but maybe the technology is being over-stretched. The original image is a new(ish) Gmail emoticon, available if you send rich text emails — which I usually don’t. Here’s a picture of the famous Christmas Island red crabs. 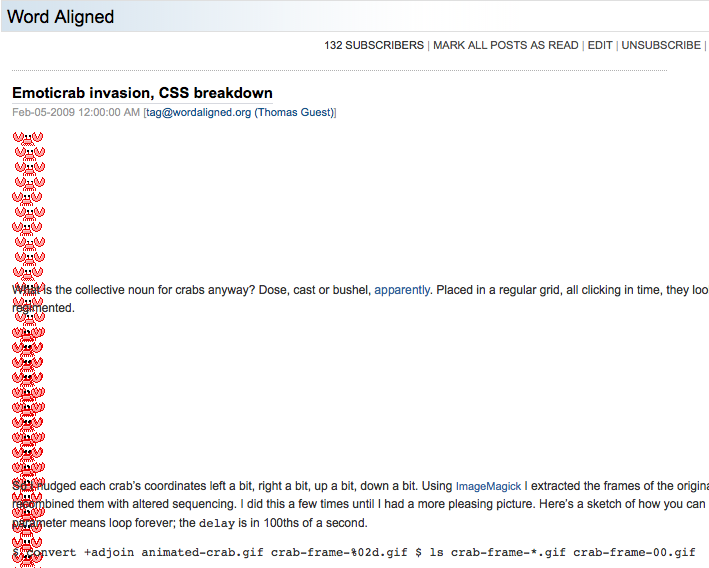 Here’s a screenshot of what it looks like in Google Reader http://www.johndcook.com/crabs.png. « Maximum of an empty sequence?